Full Sail Session Fest, originally uploaded by adambarhan. Pours a clear medium brownish-red with a slight bit of chill haze. Just a small white head fading to some splotches after a couple of minutes. A lot of grass in the aroma along with some toast and caramel much like the regular Session lager with a little extra roast. The aroma translates well into the flavor with grass/hay up front followed by some light toast and caramel. There is a little sweetness and a thicker body than a typical amber lager might have along with some light bitterness. 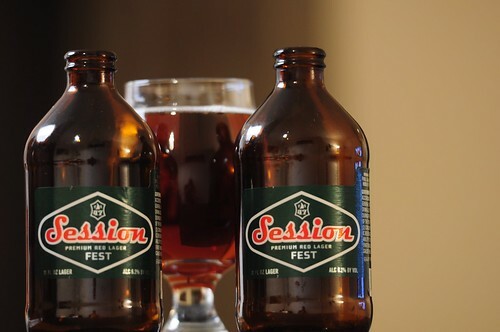 Overall, a tasty amber lager and one that, as the name would suggest, is quite sessionable. Definitely pick up a box if you see them in the store around the holidays.